Letters of Note: I hope you like "Queen II." I hope you like "Queen II." 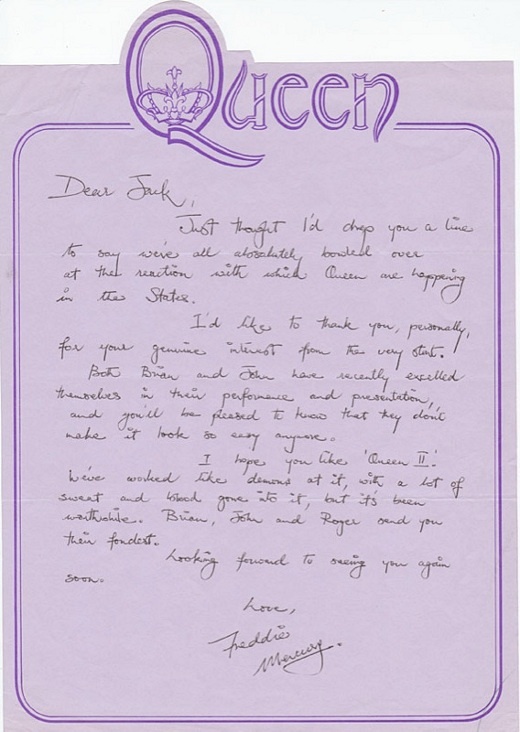 In 1973, just as Queen finished recording their second album, 27-year-old Freddie Mercury, ever the gentleman, politely wrote the following letter of thanks to Jac Holzman, founder of their U.S. label, Elektra Records; Holzman had fought hard to bring the band to his label in 1971, and his faith in them hadn't gone unnoticed by Mercury. With their debut album having recently peaked at No.83 in the U.S. charts the American response to Queen had so far been fairly positive, however nothing could have prepared them for the immense adulation that would greet them a few years down the road. Recommended reading: Jac Holzman's Follow the Music: The Life and High Times of Elektra Records in the Great Years of American Pop Culture. Just thought I'd drop you a line to say we're all absolutely bowled over at the reaction with which Queen are happening in the States. I'd like to thank you, personally, for your genuine interest from the very start. Both Brian and John have recently excelled themselves in their performance and presentation, and you'll be pleased to know that they don't make it look so easy anymore. I hope you like 'Queen II.' We've worked like demons at it, with a lot of sweat and blood gone into it, but it's been worthwhile. Brian, John and Roger send you their fondest.